Two years ago, Tracy bought a brand new trailer from her son, who just happens to be an RV and camper salesman. She named it Maggie. She was excited to use it with her husband, dog Poppy and her four children, three sons-in-law and seven grandchildren. It didn't feel quite like home, however. 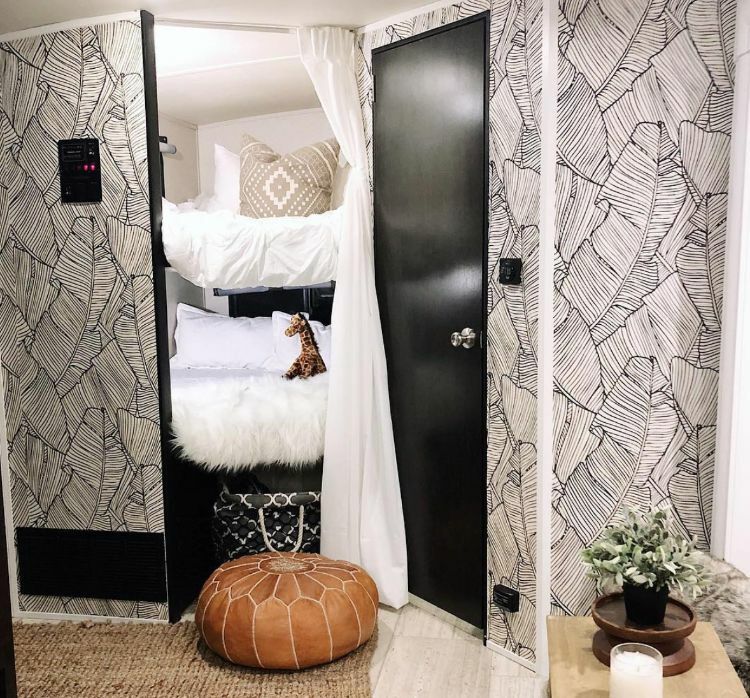 She recently decided to renovate the inside of the trailer from end to end and top to bottom, and you'll be amazed at the results. This camper was beautiful already but now is even more so. Tracy did this entire project on a budget and purchased most of the materials at home improvement and big box stores. She's very creative and crafty and did all of the work herself. 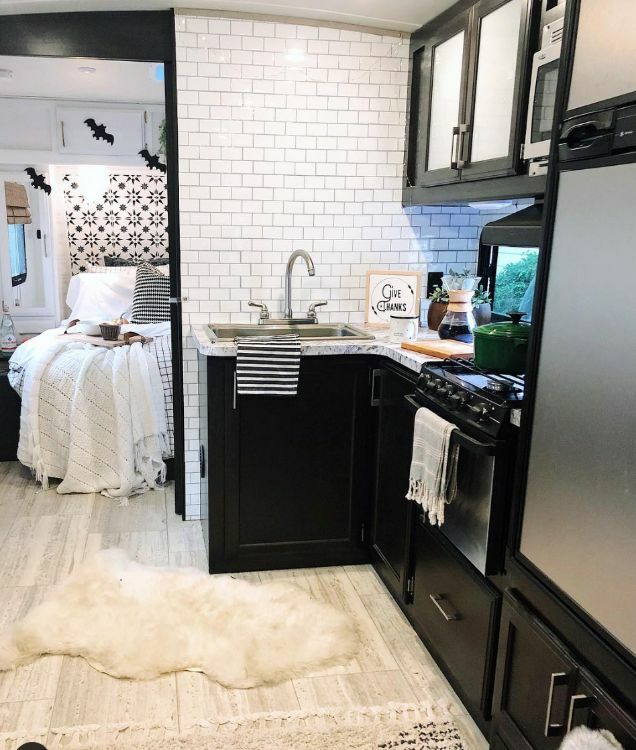 She chose a black, white and natural color scheme, which was easy to work with and match. And it really works in this space. At one end of the trailer is the master bedroom. 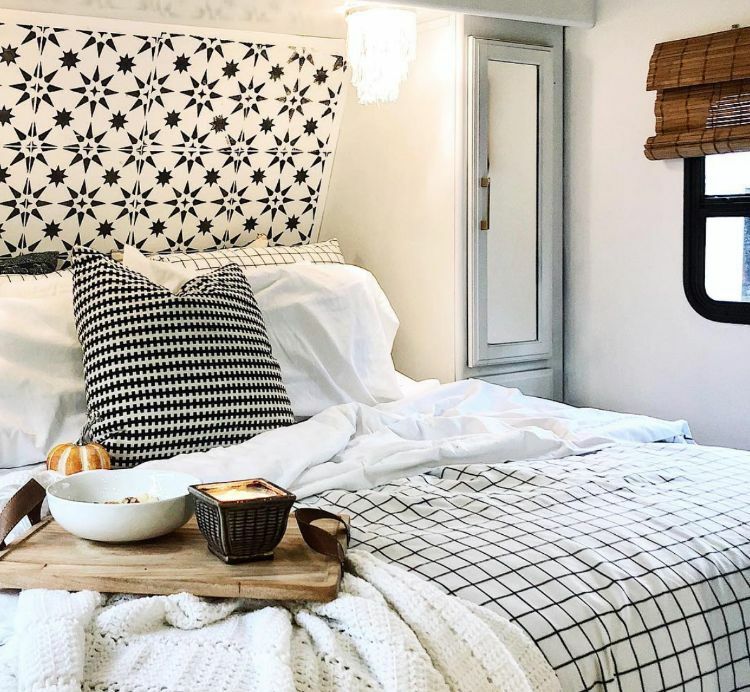 She painted the wall behind the bed using a stencil, and it really has a lovely modern yet homey effect. She created the miniature chandeliers using yarn and three metal hose clamps tied together. They work well to dim the lighting just a little and add a classy accent to the room. The poofy pillow and blankets are really inviting, beckoning visitors to climb right in. 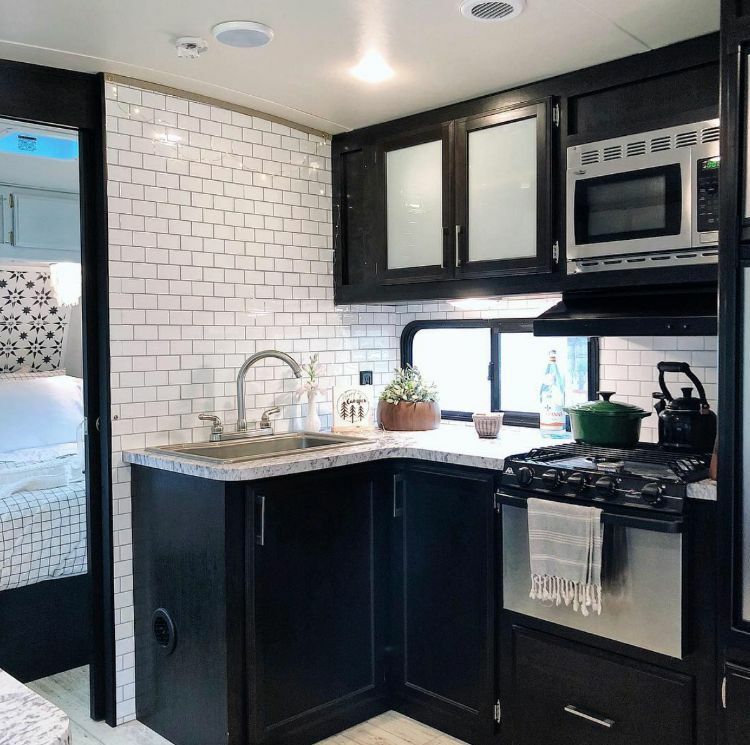 The camper came with black cabinetry with an espresso wash, but Tracy didn't like that look for the bedroom. She repainted the cabinets white and removed the silver hardware, spraying it matte finish gold before reattaching it. The window coverings here and throughout the camper are outdoor blinds. They were too wide so Tracy had to resize them, which she found challenging but doable. To make more space in the kitchen, Tracey removed the cabinet over the sink. She left the cabinets their original color and kept the factory countertop as well. The one major and very striking change she made was adding tile to the wall. This sleek-looking tile is regular stick-on, lightweight wall tile, and Tracy said it was surprisingly easy to apply. Overall, Tracy did little to renovate the kitchen. Because the trailer was just two years old when she began redecorating, it really didn't need much. Still, the changes she did make look beautiful and really help to make the kitchen a cohesive part of the larger space. The living room really incorporates the natural tones Tracy wanted to include in her space. The couch is the original one that came with the trailer, but she added a beige slipcover to make it more inviting. 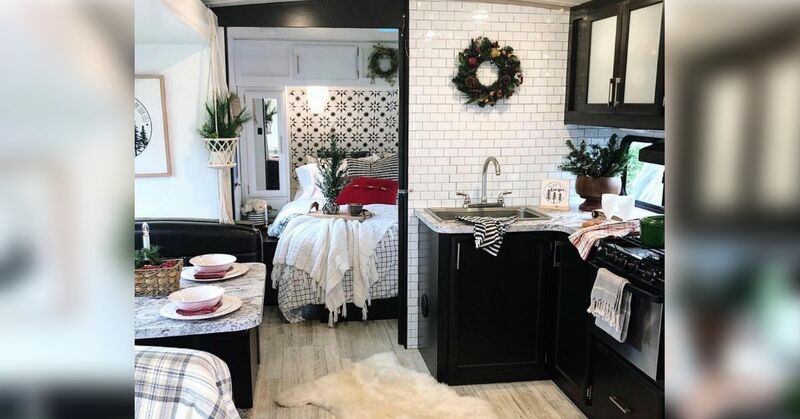 The wall art is a nice mix of black, white and brown to help tie this area together with the decor in the rest of the trailer. Tracy had a hard time finding a coffee table that was the right size and tone, so she built this one from scratch. It fits perfectly and really helps make this space look more like a home. She didn't make any changes to the dinette, but the blanket, wall art and plant add to the room's overall feel. Tracy spent a long time looking at different wallpapers before settling on this one, which was high on her list from the very beginning. 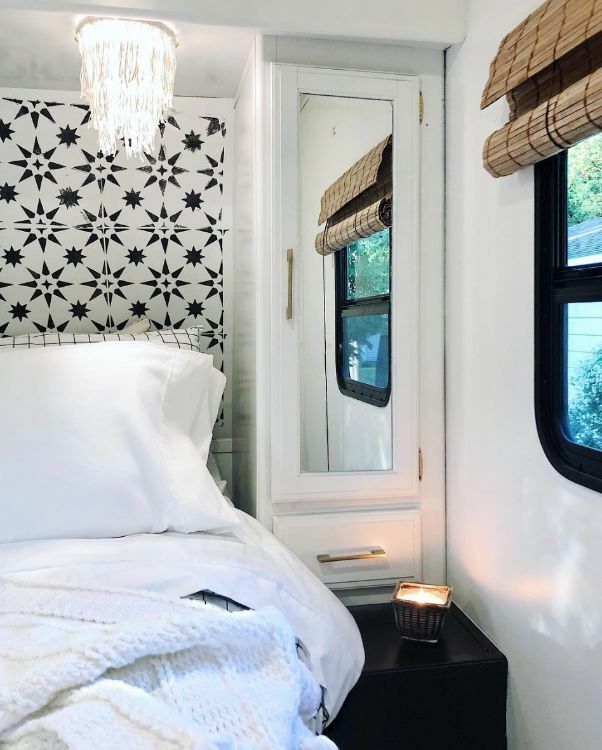 The black and white contrast ties in beautifully to the overall color scheme, and the leaf pattern reminds guests about the natural world that surrounds the camper outside. Tracy was especially proud of the simple makeover she gave to the bunk room; all told, the things she added – sheets, pillowcase, blanket, comforter and pillows – only cost $70 total. 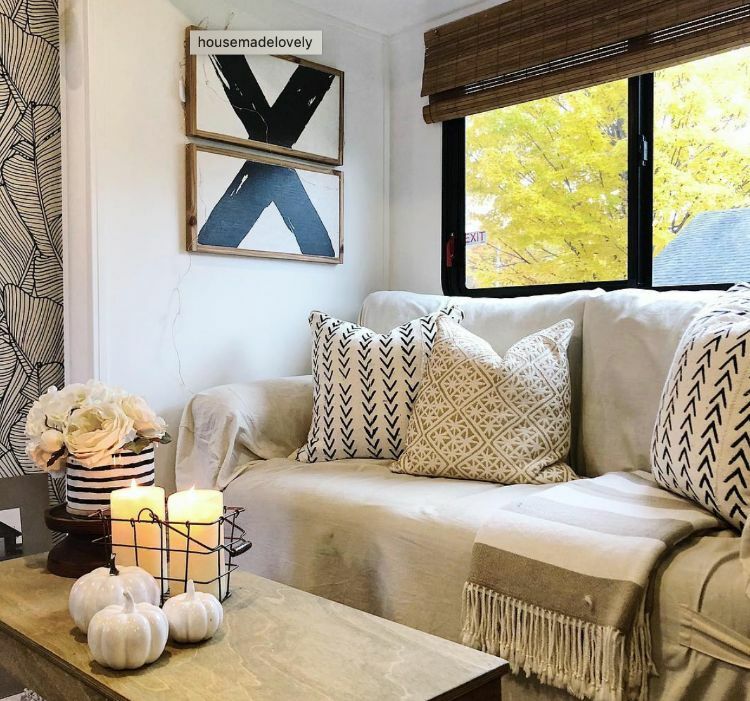 Overall, Tracy's camper renovation turned out beautifully – truly a house made lovely. 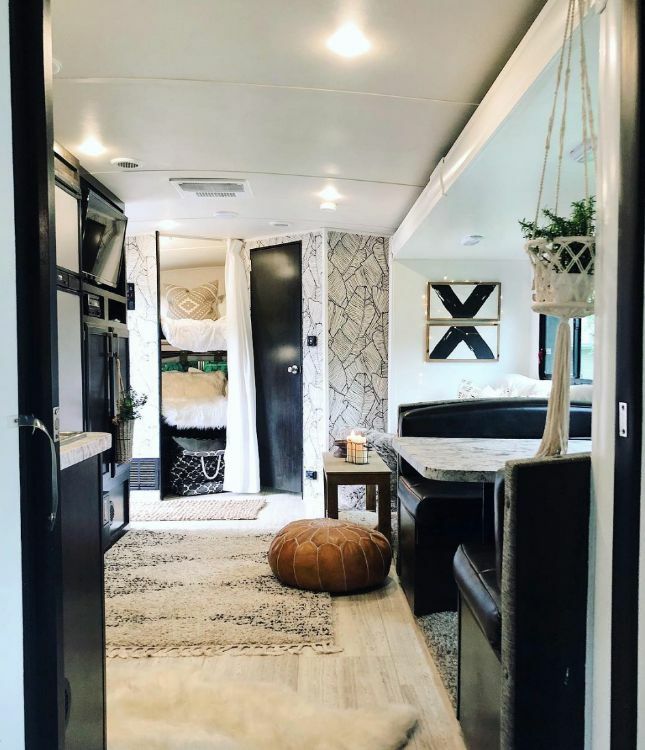 This camper went from standard to amazing with little investment and medium effort, thanks to a great eye for color and design, and motivation for change. 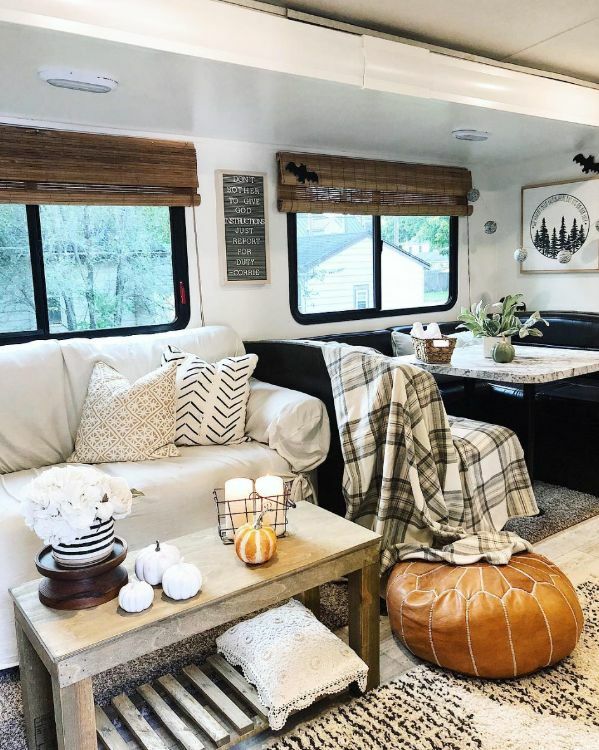 Tracy is excited to take this camper out on some big adventures soon, and it's certain that she and her husband will feel right at home when they do.